In previous posts on radicals, we’ve seen how bromine can selectively react with tertiary C-H bonds (bond strength 93 kcal/mol) over secondary (96 kcal/mol) and primary (100 kcal/mol) C–H bonds. 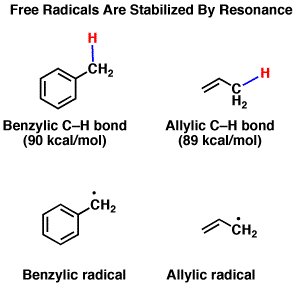 If you recall that bond dissociation energies are a good guide for predicting radical stability, then you won’t be surprised to learn that “benzylic” and “allyllic” C–H bonds can also be brominated selectively. These C-H bonds are particularly weak because the radical formed through the homolytic breaking of C-H is stabilized by resonance. How might these reactions work? 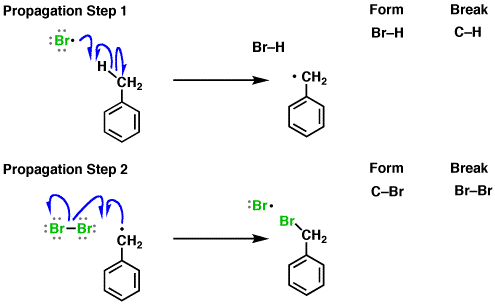 For benzylic bromination, hopefully imagining the mechanism will be straightforward: after initiation (by heat or light), bromine radical then breaks the C-H bond (forming the benzylic radical) [propagation step #1] and the benzylic radical attacks Br2 to re-generate bromine radical [propagation step #2]. These two steps repeat until the concentration of Br2 runs low, whereupon radical chain termination will occur. Let’s turn to allylic bromination. Do you see any reason why treating the molecule below with Br2 might lead to problems? You might recall that alkenes react with Br2 to form vicinal dibromides, and that is in fact exactly what would occur if we were to just dump in 1 equivalent of Br2 with an alkene. At issue here is the fact that we have 1 equivalent of Br2 swimming around, of which only a small proportion at any given time will exist as bromine radical [due to the initiation step]. 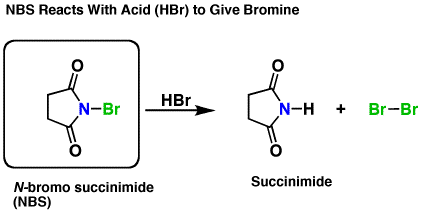 How might we solve this problem and favour the radical substitution over the dibromination. Of course, this creates a new question: how do we generate a low, constant concentration of Br2? Since one equivalent of HBr generates one equivalent of Br2, Br2 will be generated only after the completion of Propagation Step #1. *** This keeps the concentration of Br2 low and allows the free-radical reaction to out-compete the alkene addition reaction. In all other respects the allylic bromination reaction is identical to the benzylic bromination reaction mechanism shown above. However in *some* situations there is an extra twist, which we will briefly discuss in the next post. * If this explanation sounds somewhat unsatisfactory, you’re on to something. After all, doesn’t this decrease the concentration of Br• as well? One additional complication is that theoretical studies show strong evidence for a termolecular rate determining step in formation of the bromonium ion (that is, involvement by the alkene and two molecules of Br2). Decreasing the concentration of Br2 would therefore vastly decrease the rate of bromonium ion formation (and thus dibromination) relative to free radical halogenation. ** As it happens, NBS which has been left out for awhile will usually be contaminated with trace HBr (as well as Br2, which gives it a yellow or orange colour). For this reason if doing a radical reaction with NBS it’s common to avoid recrystallizing it before use, as it will remove the trace acid that jump starts the reaction in the first place. Would I be correct in assuming that unless strict conditions are employed such as 1 equivalent of NBS, a second bromine addition will take place? Or will the EWG nature of the first bromide affect a second addition? Also the physics student in me would like to point out that light is represented by h(nu) not h(gamma). Quite trivial I know. Bromonium ion formation is reversible so as long as no strong nucleophiles are present to open it, it’s possible to get away with an excess of NBS. What often happens is that you need to keep adding the radical initiator (like AIBN or peroxides) over time if the reaction stops. In the allylic bromination, after the initiation step, bromine radicals are formed. They have one electron less than their requirement and so they want to pick one electron. Then why don’t they cleave the pi bond, which has loosely bound electron, and take it from there? What you’re describing is addition of bromine radical to a pi bond, which is what happens when you treat an alkene with peroxides and HBr. In that reaction, once Br• adds to the pi bond, you obtain a radical on a carbon. If plenty of HBr is present, then the radical attacks the H of HBr and the cycle continues. However in the case of allylic bromination, that reaction is (ideally) a cul-de-sac. Once Br• radical addds to the double bond, forming that carbon-based radical, there is (ideally) nothing for it to react with since we’re not adding HBr and we’re keeping the concentration of Br2 low. Therefore the addition will revert back to the double bond and Br radical, and eventually the Br• will abstract a hydrogen from the allylic position. The vinyl C-H bonds have a bond dissociation energy of around 111 kcal/mol and the allyl C-H bonds have a bond dissociation energy of around 90 kcal/mol so it’s easier to break the allyl C-H bond and form the radical there. Is there any other solvent except of CCl4 that can be used in benzylic halogenations? I’d try chloroform or 1,2-dichloroethane. As I understood, allylic means the molecule two away from the double bond, not directly attached, and vinylic means it is attached to the double bond. Therefore wouldn’t the radical on the 3rd carbon of 1-propene be vinylic? A vinylic radical would be directly attached to the double bond – i.e. sp2 hybridized . For example a radical on the 1 or 2 carbon of 1-propene would be vinylic. The adjacent carbon (carbon 3) is allylic. If there was a 4th carbon that position would be called, “homoallylic”. Can you please tell me what will be the product when 3 methyl cyclohexene reacts with NBS/br2. 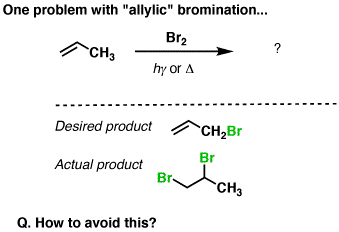 At least two different allylic bromination products are possible. why wouldn’t Br• attack on the vinylic carbon instead of allylic carbon just like it does in the peroxide effect ? And for the reason u give why would be it not applicable in peroxide effect? If you were to have a molecule with a t-butyl substituent and a methyl substituent, with which group would the Br radical be more likely to react with? The particular molecule that brought up this question is 1-methyl-3-tert-butylbenzene. Methyl. There’s no benzylic C–H hydrogen for the bromine radical to remove from the t-butyl. how can one selectively brominate one benzylic site out of two different sites……say if i want to slectively brominate the benzylic -CH2- group of p-ethyltoluene instead of the benzylic -CH3 group? The secondary radical should be more stable, so you should at least get some selectivity for that position. what happens if chlorobenzene reacts with KI ? is there any reaction? if yes where does it take place? i’ve an orgnic examen ,and i really don’t know how to handle those kinds of reactions. Bromination will not happen using HBr as a reagent. In that case all that will happen is that you will (transiently) protonate the ring. Chlorobenzene plus KI under (extraordinarily) forcing conditions MAY yield iodobenzene via nucleophilic aromatic substitution, but there are much better ways to do it. I just wanted to know why we are using CCl4 as a solvent? Nice and high boiling. If it takes heat to initiate the reaction it’s useful to choose a solvent which has a relatively high boiling point. There’s also no C-H bonds which can potentially react with free radicals. If On product 3 bromo cyclo pentene further addition of Br2, is done then what will be the product ? Yes, if you added Br2 to 3-bromocyclopentene, you would brominate the double bond. I’m a little bit confused. It seems like your explanation to achieve a low concentration of Br2 to avoid dibromination is to react a trace amount of HBr with NBS to get a small amount of Br2, and then react Br2 in the presence of a solvent and with light to end up with an allylic brominated product. Why can’t we just start with a small amount of Br2 and react that with light in the first place? Why do we have to start with HBr and NBS?